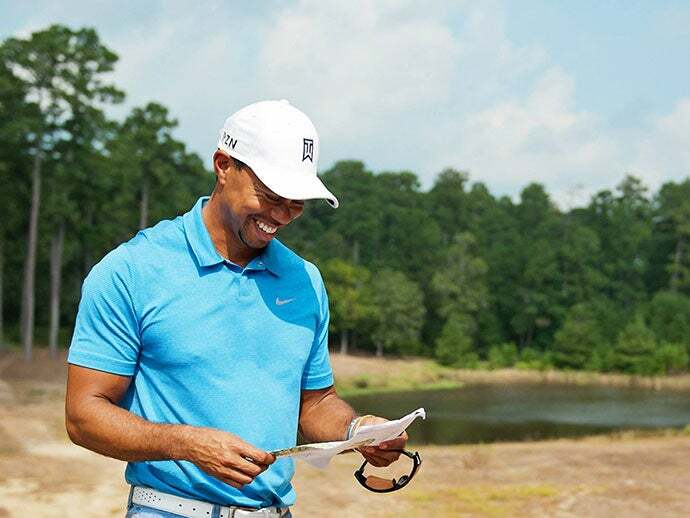 Tiger Woods at Bluejack National, his first golf course design to open in the U.S.
Tiger Woods is more than a golfer. Over the past 20 years, the 14-time major winner has expanded his brand into charity work, golf course design and the restaurant business. Here's a look at some of the biggest moments in Woods' quest to make a name for himself off the course. November 1996: Tiger Woods Foundation -- Woods and his father Earl launch the foundation to help children in the United States through after-school programs and scholarships. June 1998: Tiger Jam -- Woods begins hosting Tiger Jam in Las Vegas, featuring a concert and poker night to raise money for the Tiger Woods Foundation's activities. December 1999: Hero World Challenge -- Then known as the Williams World Challenge, Woods begins hosting this annual tournament for the top golfers in the world, as another way to raise funds for his foundation. November 2006: Tiger Woods Design -- Woods announces the creation of his new golf course design business with plans for a course in Dubai called Al Ruwaya which ultimately stalled before completion. July 2007: AT&T National -- Starting in 2007, Tiger Woods served as the tournament host for the AT&T National, now the Quicken Loans National. Proceeds from the tournament benefit his foundation. AT&T later dropped its sponsorship with Woods in the wake of his infidelity scandal. October 2011: Tiger Woods Invitational -- Tiger Woods hosts the inaugural Tiger Woods Invitational at Pebble Beach. It is a private, three-day event to benefit his foundation. December 2014: El Cardonal at Diamante -- El Cardonal, Woods' first design, opens in Cabo San Lucas, Mexico. It was inspired by the "old-style courses of Southern California" that he played growing up, with an emphasis on shotmaking and strategy. December 2014: Trump World Golf Club Dubai -- Woods announced in late 2014 that he would designed a new 18-hole championship golf course for Trump World Golf Club Dubai, to be located within the community Akoya Oxygen. It is expected to be completed in late 2017. April 2015: Pacific Links National Golf Club in Beijing -- Woods announced that he would partner with Pacific Links on a new golf course in China as part of that company's plans to expand in the region. August 2015: The Woods Jupiter -- Tiger Woods' restaurant and sports bar opens in Florida, serving burgers, beers, seafood and steaks in a friendly atmosphere. April 2016: Bluejack National -- The first Tiger Woods-designed course in the United States opens. Bluejack National is located in Texas, and hopes to appeal to families and children, as well as golfers looking to experience a layout that evokes Augusta's famous fairways. October 2016: TGR -- Tiger rebrands his business and charity ventures as TGR, complete with a new logo, and announces that the name change represents a second chapter in his "evolution as a competitor off the course," following his sudden withdrawal from the 2016 Safeway Open.